Bedrest Boutique: Thank you, ASW-Spokane! For those of you who don't know, I am a board member of the Spokane Chapter of the Autism Society of WA. Yesterday, one of my fellow board members brought me a great care package full of goodies. 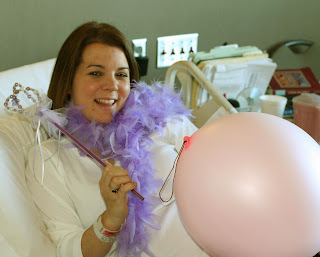 It was filled with a purple boa, purple magic wand, punchy balloons, bubbles, music CD, lotion, candles, pregnancy tea, etc, etc. What a fun surprise! Thank you to all of the board members for lifting my spirits. I really appreciate your thoughtfulness. So is the balloon what you & baby Hershey are going to look like at 40 weeks :-) Just think you are one day closer to 9 months - Yipee!!! !